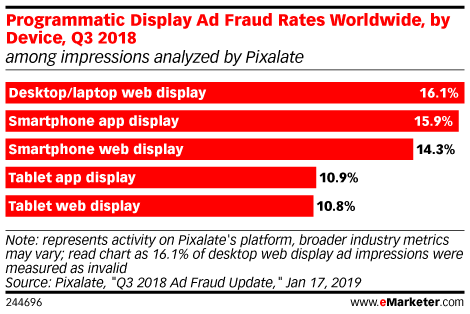 Data is from the January 2019 Pixalate report titled "Q3 2018 Ad Fraud Update." Billions of programmatic advertising impressions across over 80 million domains and over 1.5 million apps were analyzed by Pixalate's data science and analyst team during June 1, 2018-September 30, 2018. Pixalate used its proprietary algorithms to measure invalid traffic (IVT) levels across devices and channels. Geography is based off of the user pool (IP) and not the region of the domain or app. The app category data is derived from the official Google Play Store and Apple App Store. Apps with less than 5% programmatic ad share of voice based on ad type, device and region were excluded. Pixalate is a fraud protection and data intelligence platform.